Just across the Yarra River from Tutto Bene famed for its risottos lies Russell Street in Melbourne’s Central Business District which is also well-known for its upscale dining options for both Melburnians and people like us here on a short holiday in the city. PM24, one of the latest restaurants to open at Russell Street, Melbourne, is well-known for its modern French cuisine and is helmed by one of the world’s finest French chefs, Philippe Mouchel. He began his career working in French Michelin star restaurants before opening more restaurants for the legendary Paul Bocuse in Lyon, Japan, Hong Kong, Houston and Melbourne. After living in Japan for two years he returned to Melbourne in 2005 to open The Brasserie by Philippe Mouchel at Crown. His visionary modern French cuisine is now being re-discovered by Melbourne’s discerning diners at PM24. 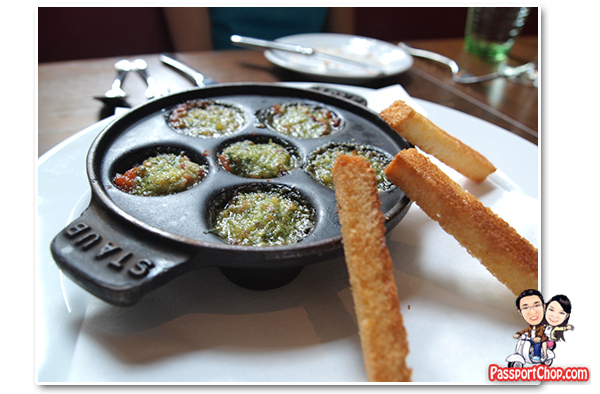 If you are a fan of escargot dishes, the savory Burgundy Style Snails (1/2 dozen for AUD19; a dozen for AUD38) prepared with tomato fondue, garlic and parsley butter and toasted bread is the perfect start to your french cuisine journey at PM24 restaurant. Another must-try fare for dinner at PM24 is its Rotissoire selections of Organic Chicken (AUD36) cooked with rosemary and preserved lemon and vegetables and the Kurobuta Pork Loin (AUD35 per pax for minimum 2-persons serving) prepared with pecan crust, caramelised fennel and spiced port jus. Rotissoire cooking is one of the oldest cooking techniques and is a natural way to bring out the flavor of the meat. Besides the savory french cuisine, we were also impressed with PM24’s ambiance with its grand windows and high ceilings which filled the dining room with natural light reminiscent of a vibrant Parisian bistro. Finally end off a perfect evening at PM24 with its yummy desserts – Paris Brest Tradition (a praline icecream at AUD18) and French crepes prepared with lemon curd and raspberries (AUD18). Check out the pictures of our conquests at PM24 at PassportChop Facebook page. When you out on a trip, you always wants to eat something delicious with your loved one to make your trip memorable. It means you can’t dream of a memorable trip without delicious food. Same theory applies on me as well. Whenever I go for any trip anywhere I like to eat yummy foods. Well now if I go to Australia then I like to go to this restaurant as well. I agree having in a trip you need or you want to eat you want it is the way of enjoying where you are and what you want .